To show how a common desk fan cools a person, Rhett Allain, a physics professor and writer for Wired magazine, performed a simple experiment. He wet a paper towel with warm water and wrapped it around a thermometer. Allain wrapped a second thermometer in a dry paper towel, and then he set both thermometers in front of a fan. Initially the fan was turned off. The temperature of the thermometer wrapped in the wet paper towel decreased—at first rapidly, then more slowly—and eventually dropped below room temperature. After the fan was turned on, the temperature of the wet thermometer plummeted another 30 ℃. By contrast, the temperature of the thermometer wrapped in the dry paper towel barely changed during the entire experiment. This experiment demonstrated the power of evaporation to cool wet objects, such as a sweaty person, and the role of a fan in making evaporation more effective. Which choice offers an accurate interpretation of the data in the graph? Choice C is the best answer because it most accurately presents data in the graph. 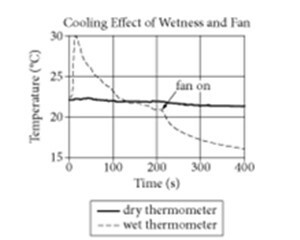 The change in temperature after the fan was turned on is represented in the graph as a rapid decrease, similar to the rapid decrease that occurred in the first 100 seconds of the experiment.